As far as we can tell the beginnings of the Basset Hound originated in sixth-century France, a country known for its many strains of hounds. Most strains had a tall version as well as a short-legged size under sixteen inches, which were called “basset” (bas in French means low-set). Both the Basset Hound and its long-legged cousin, the Bloodhound, are thought to be descendants of the famed St. Hubert hounds. St. Hubert, a churchman, was the patron saint of the hunt, who set out to develop a new strain of hound, which looked similar to today’s Bloodhound. Many authorities feel the Basset was a result of a mutation in the St. Hubert strain. This genetic deviation produced a short-legged, dwarfed hound, whose slower movement and low-set form was to prove useful for hunters on foot in search of small game. With his long ears helping to stir up the scent, packs of bassets were used to drive small prey, such as rabbit and hare, from dense undercover into open terrain where hunters could move in for the kill with spears (shown below), nets or clubs. The sport of pack hunting with Basset Hounds continues to this day in France and England.In addition there are some active packs of basset hounds in the United States. The Basset was not well known to British sportsmen before 1863, in which year specimens of the breed were seen at the first exhibition of dogs held in Paris, and caused general curiosity and admiration among English visitors. In France, however, this hound has been used for generations, the British used Spaniels, as a finder of game in cover, and it has long been a popular sporting dog in Russia and Germany. In early times it was chiefly to be found in Artois and Flanders, where it is supposed to have had its origin; but the home of the better type of Basset is now believed to have been chiefly in La Vendee, in which some remarkably fine strains were produced. First dog show was held in Paris in 1863 that included bassets. The breed wasn't imported to England until 1866. Dogs and All About Them published in 1934 States: As with most imported breeds, the Basset-hound when first exhibited was required to undergo a probationary period as a foreign dog in the variety class at the principal shows. It was not until 1880 that a class was provided for it by the Kennel Club. 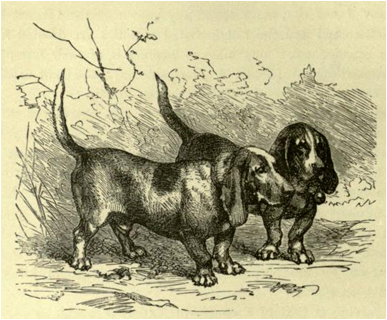 The following is an excerpt from the chapter on basset hounds in Cassell's Illustrated Book of the Dog published in 1881. This is perhaps the very first Standard for basset hounds in England. It was republished in The New Book of the Dog, Chapter XXVII in 1907 which states, “Perhaps the most explicit description of the perfect Basset-hound is still that compiled twenty-five years ago by Sir John Millais. It is at least sufficiently comprehensive and exact to serve as a guide.” It’s very interesting to compare it to the current AKC Standard. From The Illustrated London News, May 18, 1886. Note: Basset hounds, a basset griffon vendee and dachshunds were shown together in the early shows. Bassets are divided into two distinct breeds the Basset Français and the Basset Allemand, which is the German Dachshund. Now the Bassets Francais are divided into two classes the Basset a poll ras (smooth-coated), and the Basset d poll dur, more commonly known as the ' Basset Griffon.' From Cassell’s Illustrated Book of Dog. 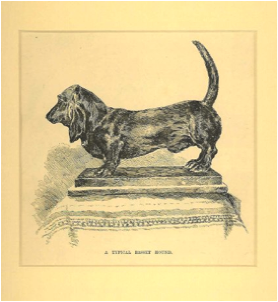 This print, taken from a magazine published in 1888, was intended to portray the "standard" for the breed. On the reverse is a cutting from the magazine, written by the Secretary of the Basset Hound Club at that time, was a note explaining the reasons why it was considered to be appropriate to describe the ideal breed type in the form of a picture rather than in words. 1890 illustration by Louis Wain of basset hounds in a dog show at the Crystal Palace, London, England. 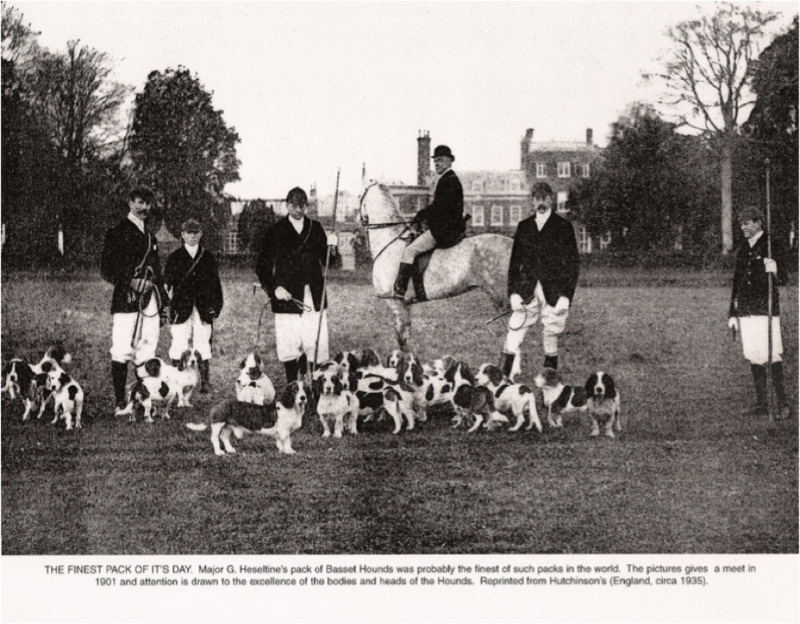 British Dogs, Their Points, Selection and Show Preparation, Chapter XXII - The Basset-Hound published in 1903, is a source for information on the origins of basset hounds. Contrary to all newer books on the subject the author dispels the idea that modern Basset Hounds have come about as a result of the mating of a bloodhound with a Basset (Hound). The following quote from that book sounds familiar. I hope that, in breeding Bassets for hunting purposes, owners will not neglect the heavy and somewhat ungainly appearance that they should have, and gradually get them higher on the leg and lighter in bone and body; by so doing they may increase the speed, but they will lose the endurance, and they will in time be nothing better than deformed Beagles. I have already noticed a tendency in this direction in packs. If Bassets are not fast enough for a man, let him by all means keep Beagles instead. You cannot expect a Clydesdale to go as fast as a thoroughbred, nor would you think of breeding them to do so. Keep each to his real work: both are good, but their style may suit different tastes. 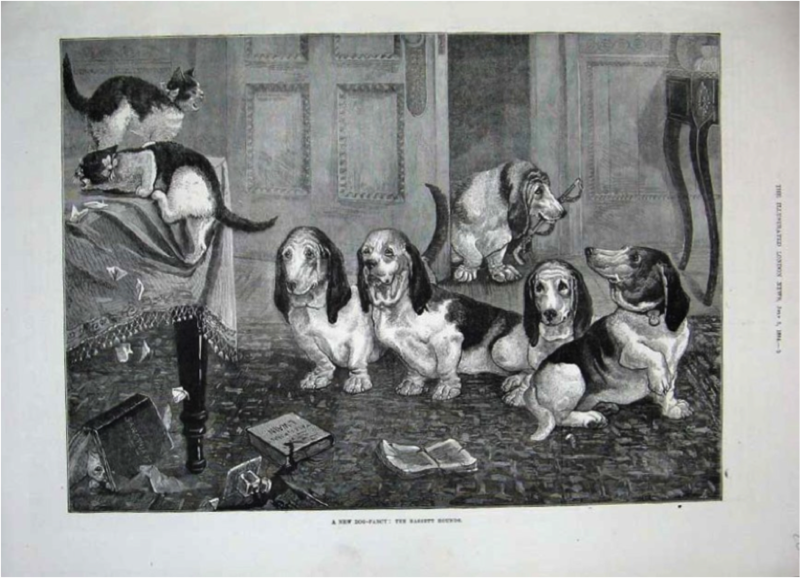 Perhaps the earliest mention of basset hounds as pets came in The Illustrated London News, July 5, 1884. 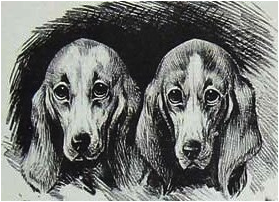 The illustration below from that paper was titled “A NEW DOG-FANCY THE BASSET HOUNDS”. During the Victorian era basset hounds were introduced to the British Isles. 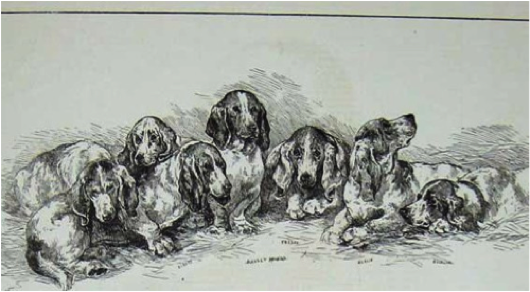 Lord Galway imported two of the "French Bassets" into England in the late nineteenth century as did Sir Everett Millais and others. Millais, who established an ambitious breeding program in conjunction with other Basset fanciers, is considered the father of the breed in England. He exhibited his first Basset at a show in 1875, but it was not until the Wolverhampton show in 1880 that enough examples of the breed were entered to attract broader public interest. Interest in the breed was also furthered when Queen Alexandra (shown below) obtained several Bassets for her kennels at her estate in Sandringham. 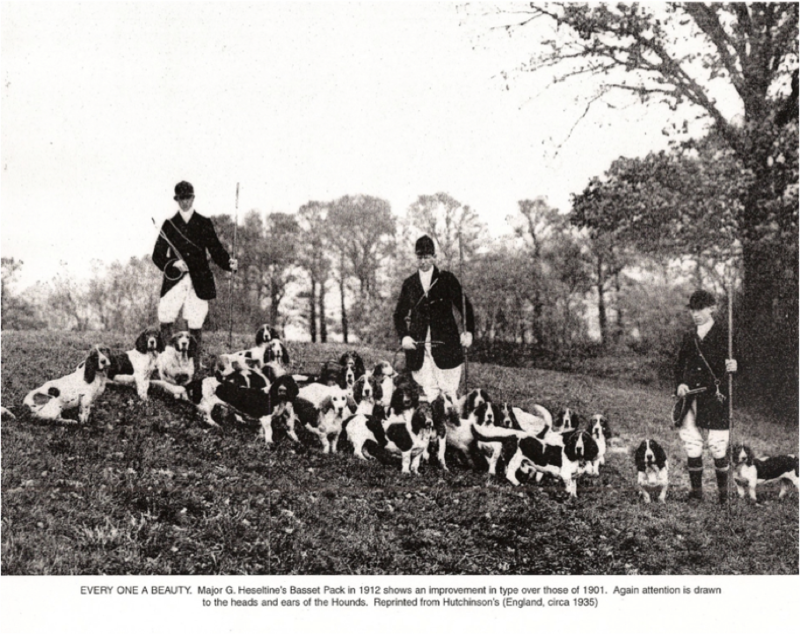 Within a generation of their introduction even British citizens who did not hunt owned basset hounds. Queen Victoria even had a few basset hounds of her own. Queen Alexandra with her grandchildren and dogs, in a painting by Frederick Morgan and Thomas Blinks of 1902. This shows the Queen outside the kennels at Sandringham, surrounded by a variety of dogs including a Borzoi, two collies and two basset hounds. Some historical accounts state that George Washington was given some hounds that resemble what we consider to be basset hounds today. Information on the actual dogs and a good description is not available. Just before the turn of the 20th century the dog we presently call the basset hound was introduced to North America. While some sources state an earlier introduction, the research doesn’t support these accounts. 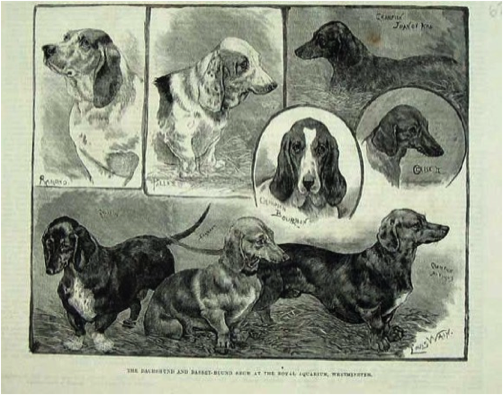 The AKC registered its first basset hounds in 1885. They became an officially recognized breed, and bassets were beginning to be bred and entered into dog shows. The February 28, 1928 Time magazine covering the 52nd Westminster Dog Show in New York featured a basset puppy on its cover. America fell in love with the melancholy look of the hound and the basset hound began to become a poplar household pet breed. The American Book of The Dog, The Basset Hound by Lawrence Timpson published in 1891 may be the first published material on the breed in this country. It contains an early breed Standard and point scale for judging basset hounds. ■ Head — resembling that of the Bloodhound in shape and dignity of expression, long, rather narrow, and well peaked, with little or no stop. Jaws long, strong, and level; teeth rather small. Nose usually black; but some good ones have had considerable white about theirs. Mouth well flewed. Ears long, large, and soft, hanging like the softest velvet drapery. Eyes are a deep brown, very expressive, rather deeply set, and showing a good deal of haw; expression affectionate, intelligent, and good-humored, though occasionally reflective and melancholy. ■ Forelegs and feet — The shoulders are of great power. Legs very short, and turning inward at the knees; and the feet, which appear to be a mass of joints, considerably bent out. ■ Ribs and loin — The back and ribs are strongly put together, and the former is of great length. ■ Hind quarters and stern — The hind quarters are very strong and muscular, the muscles standing out, and clearly defined down to the hocks. ■ Coat — The skin is soft, and the coat smooth and close, though moderately hard and very weather-resisting in quality, and when the dog is in condition, showing a beautiful natural gloss. ■ Color — The tri-color, which has a tan head and a black and white body, is much preferred; but they come in all the varieties of white and black-and-tan. ■ Size and symmetry — Bassets come in all sizes, from nine to twelve inches at shoulder and at from twenty-six to forty-eight pounds in weight and over. The best size is say about eleven or twelve inches at the shoulder and about forty to forty -five pounds in weight. The Basset has more bone in proportion to his size than any other breed, and his symmetry is an important point in his make-up. No especial care is necessary in preparing Basset Hounds for the show bench, further than ordinary attention to health, condition, and coat. These dogs usually "show up" well on the bench, and rather appear to enjoy their outings at shows. The following quote from the book is rather interesting and speaks well for the origin of the breed. Basset Hounds are by all odds superior to Beagles for rabbit-shooting, beating them in nose, tongue, and staying powers. Their powers of scent are marvelous; and so well do they indicate their excitement by their waving stems, that as the scent becomes warmer and warmer one can tell almost exactly the moment when they are about to open on it. Their clear, deep, bell-like notes are far sweeter than those of any other Hound, and when they are hidden in cover, tell exactly what they are doing. When once heard, the clear ring of their notes is never forgotten. Their short, crooked legs seem almost incapable of being tired, and their natural pace is about seven miles an hour. For hunting on foot they are as superior to Beagles as for being shot over on rabbits, but their value renders a pack of any size out of the question. The scratch pack that the members of the Basset Hound Club kept, showed very good sport. Basset Hounds have the best of tempers. I have never known of one to attempt to bite, except in the case of puppies when being punished for some misdemeanor or other, and then they did it from fright more than from ill nature. In fact, their disposition is a trifle too mild and inoffensive for a sporting dog; although they run game with the utmost keenness, and when their quarry is standing ''at bay" they will give tongue with the utmost fierceness, usually showing no desire to go in for blood, even in the case of a rabbit. In the latter case they would usually play with it as though it were a puppy, if left to themselves. Against other dogs, too, they seldom try to defend themselves. The basset hound, as seen above, has been around for well over one hundred years in a form similar to the breed we know today. As time and resources permit I will be expanding on this page by including more on the history of our breed. Webmaster’s Note: The pictures on this page are published here for educational purposes. Copying them for other reasons is a violation of Copyright laws. Crufts is considered today as the biggest and most prestigious dog show in the world. There really was a Mr Cruft - Charles Alfred, who was born in 1852 - who worked as a traveling dog-biscuit salesman before he had the idea of staging a dog show to promote his wares. 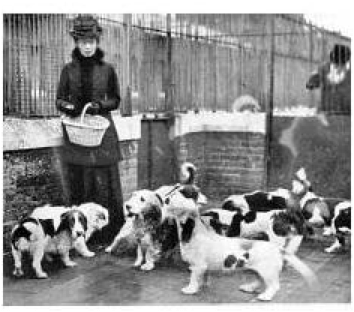 In 1886, Cruft was approached to run a dog show for terriers in London by the Duchess of Newcastle and so on 10 March his show opened at the Royal Aquarium in Westminster, London. 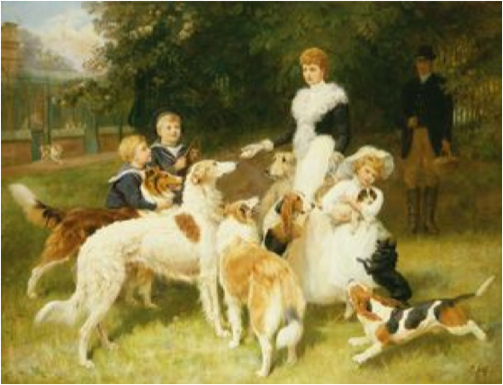 Entitled "The first Great Show of all kinds of Terriers", the show received 570 entries across 57 classes and included Lord Alfred Paget among the patrons. Collies and several breeds of toy dogs were added by 1890. 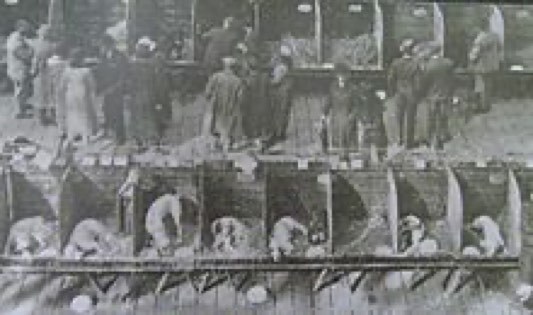 This gradual expansion of breeds led to the creation of the first show to be named after Cruft was in 1891, when "Cruft's Greatest Dog Show" was held at the Royal Agricultural Hall, Islington, with part of the deal to hold the show at that location was to restrict the venue to only allowing Cruft to run dog shows at the location. He designed the logo himself, the head of a Saint Bernard surrounded by a collar with a crown on top. Crufts dog shows enjoyed royal patronage from the start. Queen Victoria's collie, Darnley II, and two of her pomeranians won prizes at the 1891 show. King Edward VII also entered dogs prior to becoming King. Crufts' royal connection continued in 1897 when the Prince and Princess of Wales (later King Edward VII and Queen Alexandra) entered six dogs, including the prince's lapland sledge dog. All six won prizes. In 1893, Tsar Alexander III of Russia sent eighteen Borzois to compete, and from 1916 King George V entered his Labrador Retrievers regularly. Every British monarch since has been involved in some way. 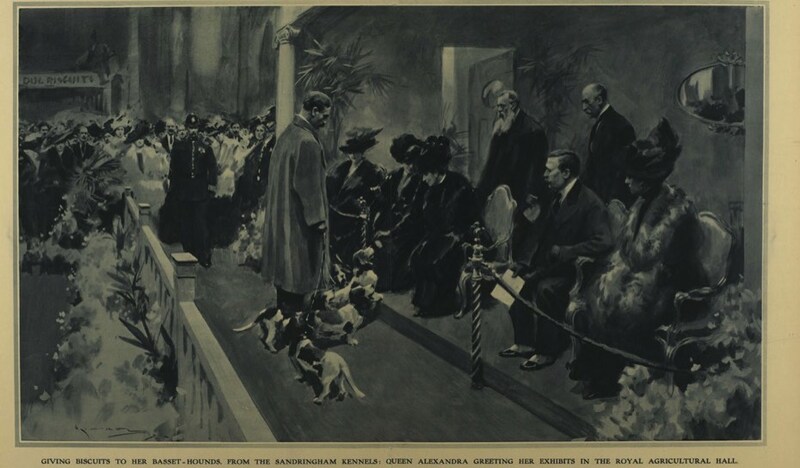 Queen Alexandra also entered some of her basset hounds at Crufts as shown in the illustration above. The year of this painting is unknown. Mr. Crufts introduced a system where competitors would pay to enter their dogs, and make additional payments if they wished to take the dogs away each night of the three-day competition, and again pay if they wanted to take them away early on the final day. By 1914, the show had grown in popularity until it was recognized as the largest dog show in the world and by 1936 when the show celebrated its Golden Jubilee, over 10,000 dogs were entered at the event. Much of what he did has carried on to present dog shows. They were long, low hounds, shaped much like a Dachshund, with crooked forelegs at the knees and with much more bone and longer heads than on Beagles. They were not the dark tan colour of Dachshunds but the colour of Foxhounds with a certain amount of white about them. As stated in the FCI Standard for Basset Hounds, " The Basset was reputedly bred by monks in France in the Middle Ages to hunt in heavy cover and is able to hold its nose close to the ground. Though closely related to the entire family of French Bassets the breed was developed to perfection in Britain." Lord Galway's letter to Major C. Henseltine (who's later packs of basset hounds are shown above) that year is the first occurrence of the name "basset hound" in British literature and the first time it was applied to a specific breed . This is considered by many to be the first introduction of pure-bred basset hounds to England and their continued breeding on a scientific basis began. Webmaster's Note: Due to limitations of this website the following is just a brief history of Basset Hounds. While it takes books to cover this subject in any depth another history is available as a pdf file that can be downloaded. Please understand that this is a work that is still being edited and additional information needs to be addded. LINK After conducting extensive research on the history of basset hounds this and the pdf version historical account will be edited when time allows. I'm in the process of putting the information together to make it interesting and more comprehensive. The improvements will be announced in Basset Tales. 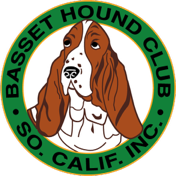 For now I have added two new pages to this website regarding the History of Basset Hounds. The first covers the period of time from the beginning of what is known about the development of hounds up until 1866 when Basset Hounds as we know them today were imported into Great Britin by Lord Gallway. A timeline listing many of the historical events in the history of our breed from 900 to 1954 AD.